Easter is coming up this weekend and from my spot up here above you, I can see people getting ready for all kinds of celebrations. For some people, Easter is a religious holiday, for others it's a celebration of spring and rebirth. 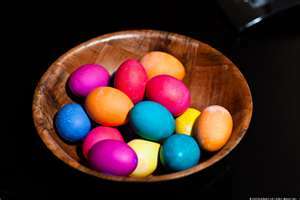 Whatever you are celebrating at Easter, it seems it's a pretty colorful time of year with painted eggs and fancy hats. The most common Easter colors are yellow and purple. That makes sense to me. The yellow color makes me feel energized. I feel like I can do anything I set out to do. There is a lot of energy around us with all those flowers starting to blossom, the trees getting new leaves, and grass starting to grow again. The purple color makes me realize I can understand what you are doing, and sometimes what you are feeling. Purple helps people feel connected to nature, as though we are a part of nature's spring celebration. If you're having trouble finding hidden treasure like those painted eggs, try wearing purple- maybe it will help your intuition. Then you'll know just where those things are. If you're celebrating with balloons and one gets away- wave to me and smile. I'll be smiling right back at you!